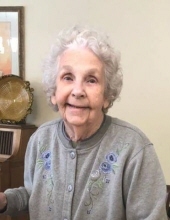 Mildred A. Leeker, age 89, of Sullivan, MO, passed away on Tuesday, November 13, 2018 at Cedar Crest Manor in Washington, MO. Mildred Audrey Reed was born on March 4, 1929, in St. Louis, MO, to the late William H. Reed and Ruth Dobbs. She attended Baden Elementary School and graduated from Beaumont High School, Class of 1947. Mildred was united in marriage to Norman Leeker on May 15, 1949 at Holy Cross Church in Baden and they were blessed with six children, Norman, Michael, Jim, Stephen, Mark and Janet. They lived in the city for a brief time before moving to Cedar Hill Lakes, and then Fenton, until 1967. At that time, they moved to Union, until Normans passing in 1972. Millie then moved to Bourbon and worked many years as a receptionist for Dr. Giem. Millie was an active member of Seventh Day Adventist Church. She enjoyed singing and playing the piano and organ at church. Millie also liked jigsaw puzzles, sewing and embroidery and reading. She will be missed dearly by her loved ones and friends. Mildred is survived by five sons, Norman Leeker, Jr. and wife Mary of Washington, MO, Michael Leeker and wife Nancy of Union, MO, Jim Leeker and wife Mary of Terrell, TX, Stephen Leeker and wife Jeannine of Schuylkill Haven, PA, and Mark Leeker and wife Ginny of Lincoln, NE; 9 grandchildren; 23 great grandchildren; nieces & nephews, other relatives and friends. She was preceded in death by her husband, Norman Leeker, Sr.; her infant daughter, Janet Ruth Leeker; her parents, William H. Reed and Ruth Dobbs; two brothers, William Reed, Jr. & Harold Reed; and one sister, Sylvia Scheer. Funeral Services will be conducted 12:00 PM, Thursday, November 15, 2018 at Seventh-day Adventist Church in Sullivan, with Pastor Rodney Osborne, Jr. officiating. Interment will follow in Immaculate Conception Cemetery in Union, MO. Visitation will be held from 10:00 AM to 12:00 PM, Thursday, at Seventh-day Adventist Church. Memorials contributions, in memory of Mildred, may be given to the Seventh Day Adventist Church in Sullivan or the Missouri Veterans Home in St. James, MO. To send flowers or a remembrance gift to the family of Mildred "Millie" Leeker, please visit our Tribute Store. "Email Address" would like to share the life celebration of Mildred "Millie" Leeker. Click on the "link" to go to share a favorite memory or leave a condolence message for the family.